Ted Deppe and Jeanne Marie Beaumont will be the faculty for the Stonecoast in Ireland residency in beautiful Dingle, County Kerry, next summer. The residency will take place from 8 July to 15 July 2015. An invitation to apply will be sent out to all students on 1 November 2014 and applications will be accepted until 12 November. Any questions about the Irish residencies can be sent to Ted at theodore.deppe@maine.edu. Sheila Boneham (Creative Nonfiction/Cross Genre, S’13) is happy to announce the launch of Catwalk, her third mystery from Midnight Ink and her twentieth book, in October. Early reviews have been encouraging, including “Intricate plot and smart characters” from Booklist. Eric M. Bosarge‘s (Popular Fiction, W ’12) horror story “My Father’s House” will appear in the October issue of Pithy Pages. Subscriptions are now free. 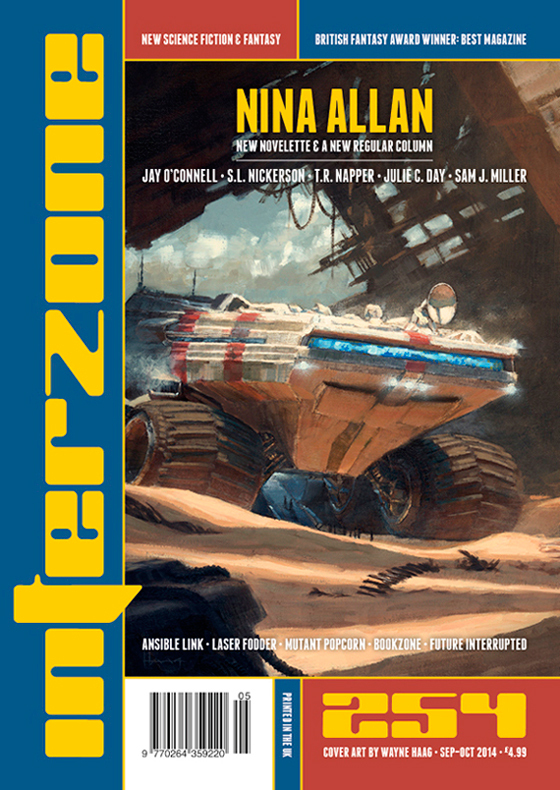 Julie Day‘s (Popular Fiction, S’12) story “The Faces Between Us” is now available in the latest issue of Interzone. It started out as a flash piece written for the 2013 Art & Words Show, curated annually by Stonecoast’s own Bonnie Jo Stufflebeam. Tamie Fields Harkins‘ (Creative Nonfiction, S’12) poem “We Thought We Needed a Boat” and her essay “The Crossing” were both published in the Fall 2014 issue of Connotations, the journal associated with the Island Institute, which hosted Tamie as writer-in-residence in Sitka, Alaska, last April. Lesley Heiser (Fiction, S’11) was proud to have her memoir piece “Saudade” published next to a poem by one of her favorite poets, Martin Espada, in the second edition of The Stonecoast Review. Also, her unpublished novel, “The Actor,” was a top five finalist in the 2014 Brighthorse Prize Novel Contest. 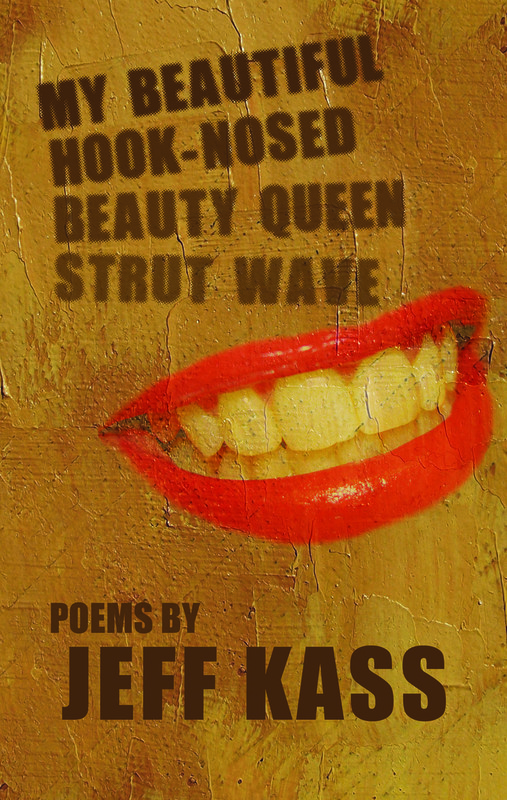 Jeff Kass (Fiction, S’09) is proud to announce the release of his first full-length poetry collection My Beautiful Hook-Nosed Beauty Queen Strut Wave from Dzanc Books. The book will be released in Ann Arbor, MI, on Thursday, October 23, at 8:00 p.m. in a reading at The Neutral Zone, and in New York at 7:30 p.m. Wednesday, October 29, in a reading at Greenlight Books in Brooklyn. Stonecoast faculty mentor and National Book Award Finalist Tim Seibles says of Kass’ poetry collection, “These are the poems of many men who grew up in this country bursting at the seams with boyness, who did the best they could to grow into useful men—fathers, teachers, plumbers. 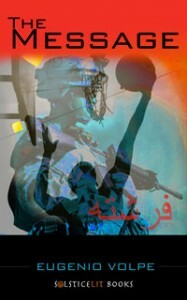 Line by line, this book unfolds like a well made movie.” Books will be available for purchase online at www.dzancbooks.org. Joe M. McDermott (Popular Fiction, S’11) sold “Paul and His Son,” an excerpt from an unpublished science fiction novel, to Asimov’s Magazine and the short story “Fox in the Fields” to 3-Lobed Burning Eye. Ellen Meeropol (Fiction, W’06) will be on a panel, Balancing Commitment and Craft in Political Fiction, at Pace University on November 5, 2014. The panel is sponsored by the New York City chapter of the Women’s National Book Association and also includes Céline Keating, Marnie Mueller, Elizabeth Nunez, and Tiphanie Yanique. Janet Passehl‘s (Poetry, S’10) manuscript, “Clutching Lambs,” has been accepted for publication by Negative Capabilities Press. Cristina Perachio’s (Fiction, S’14) story “Nightstands” was selected as one of the Top 5 Stories of the Year in Narrative magazine for 2013-2014. “Nightstands” was originally selected as a finalist in the Narrative 30 Below Story & Poetry Contest in 2013 and ran as Story of the Week in the Spring of 2014. Felicity Stone (Creative Nonfiction, ’08) is excited to announce that Narrative magazine has published an excerpt from her memoir Maggie, a project she began at Stonecoast. Eugenio Volpe‘s (Fiction, ’05) eBook The Message was recently published by SolsticeLit Books. It’s the story of Adam Zane, a young veteran struggling with PTSD, who copes by shooting hoops and hating NBA hometown traitor Elijah “The Message” Adams. The eBook may be purchased on Amazon or the SolsticeLit Books website. 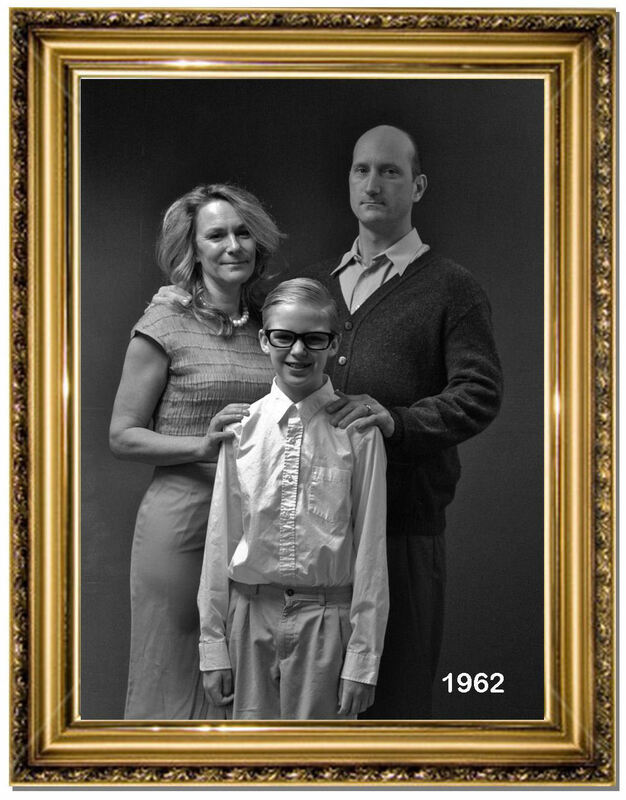 Marco Wilkinson’s (Poetry, S’13) essay “The Gift of Failure” appears in the Fall 2014 issue of the magazine Taproot. Tamra Wilson (Fiction, S’10) took second place in the Ruth Moose Flash Fiction Contest sponsored by Charlotte Writers Club. Her piece, “I Hear Music,” was judged by author Ruth Moose herself, a former creative writing faculty member at UNC-Chapel Hill, and Tamra was invited to read her piece at the Charlotte Writers’ September meeting. John Christopher Nelson‘s (Fiction) essay titled “Been Haunted” will be published online by Paper Tape Magazine in a series of haunting-themed stories/essays. The relevance to Stonecoast is particular: the essay is based on a conversation with Stonecoast peers on the Blasket Islands during our summer 2014 residency in Dingle, Ireland, with the Deppes. Michael Kimball (Popular Fiction, Scriptwriting) is the recipient of the 2014 John Gassner Memorial Playwriting Award for his play Duck and Cover. The Gassner Award is presented annually by the New England Theatre Conference, “New England’s oldest, largest theatre association.” On October 25th, a staged reading of Duck and Cover will be presented at the NETC Awards Banquet at Westford Regency Inn and Conference Center, 219 Littleton Road, Route 11, Westford, MA, 01886. 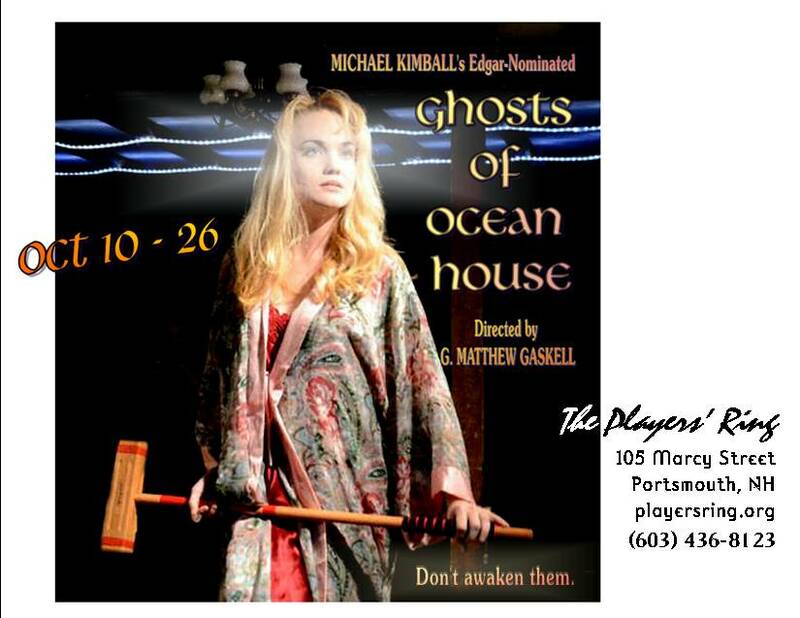 His play Ghosts of Ocean House runs October 10-26 at The Players’ Ring, 105 Marcy Street, Portsmouth, NH. Early reservations are recommended and can be made at www.playersring.org or by calling the Players’ Ring at (603) 436-8123. Ghosts of Ocean House received the 2006 F. Gary Newton Playwriting Award and was one of three finalists for the 2007 Edgar Award (Mystery Writers of America). The play is a psychological drama about a brother and two sisters who, to inherit their late father’s Victorian seaside mansion, must spend one week for ten years living together harmoniously—or else lose the house to charity. This is their final year, their final week. But the newest family member, a flighty, fragile young bride named Darlene, harbors a dark, mysterious past—as does the quiet old house—and when they come together, ghosts begin awakening. Suzanne Strempek Shea (Creative Nonfiction, Fiction) will be launching her newest book, the novel Make a Wish But Not For Money, October 8 at 7:00 p.m. at Broadside Bookstore in Northampton, MA. She’ll have many events in October, including two weeks’ worth with Mags Riordan, founder of the Malawian clinic detailed in This Is Paradise, which came out in the spring and which Suzanne will continue to promote through the end of the year. Mags visit with be a rare chance for readers to meet her, as she lives in Malawi. A full schedule of events is available at http://www.suzannestrempekshea.com/index.php?page=upcoming-events#240. 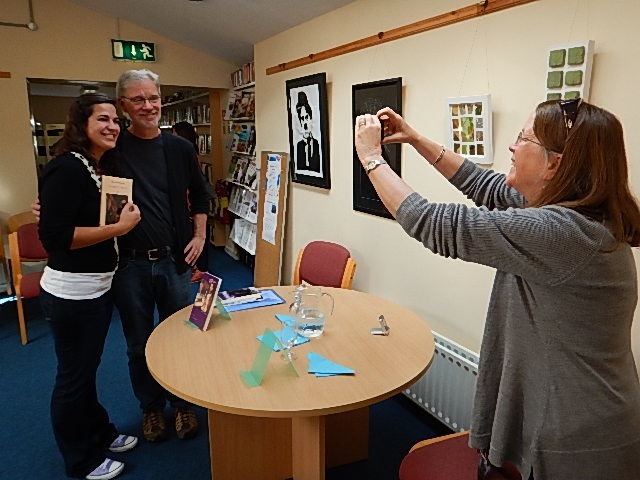 Suzanne has just returned from two weeks of promoting This Is Paradise in Mags Riordan’s native Ireland. Readings included one at The King Sitric in Howth, site of the January Stonecoast Ireland residency, and a night at Galway’s Charlie Byrne’s Bookshop during which Stonecoast Ireland Coordinator and Co-Coordinator, Ted Deppe and Annie Deppe, also read. 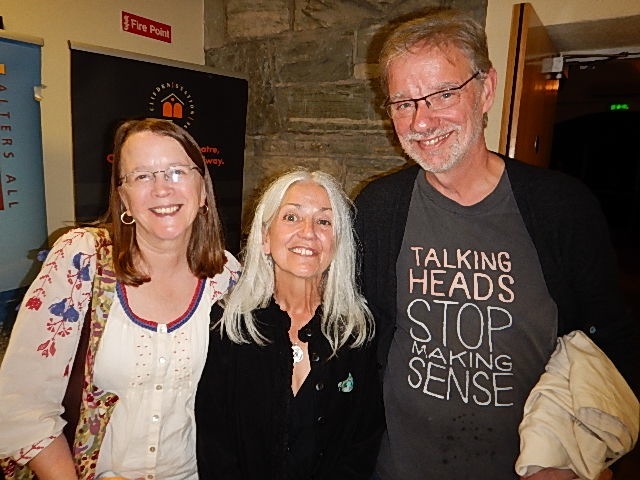 Suzanne and husband Tommy attended Ted’s launch of his collection Beautiful Wheel at the 37th annual Clifden Arts Festival, and Suzanne read at the festival a few days later during a concert featuring Leo Moran and Anthony Thistlethwaite. The festival ended with readings by Paula Meehan and Theo Dorgan, who many in our community will know from the two having been guest lecturers at Stonecoast Ireland. Paula last September was awarded the Chair of Irish Poetry, Professor of Poetry, by President Michael D. Higgins. Big thanks are sent by Suzanne to Aaron Hamburger, who wrote for the Matador Network about Suzanne’s point-of-view decisions in This Is Paradise. Annie and Ted Deppe with Paula Meehan at center. 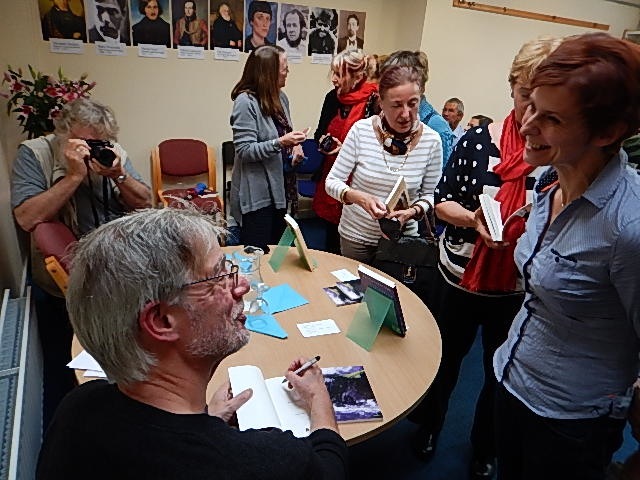 Ted Deppe signing at his launch of Beautiful Wheel at the Clifden Arts Festival. Stonecoast alum Christina Mock, now living in Barcelona, made a surprise visit to former mentor Ted Deppe‘s reading at the Clifden Arts Festival. Here, she and Ted are snapped by Annie Deppe.